Modern holiday home 5 minutes from lake and Omori and Kuratau boat ramps. 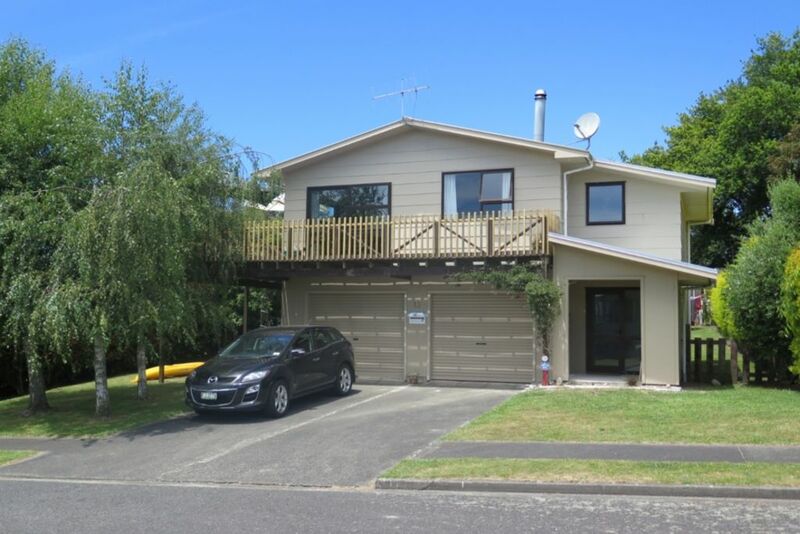 Situated in a quiet street 40 minutes from Taupo, 45 minutes to Whakapapa ski field, 14 k's to Turangi and Tokaanu hot pools. Five minute walk to Omori general store for supplies or weekend evening takeaways. Tennis court at the end of street, close to playground and many delightful bush walks. Perfect for families and toddler safe with stair-gate and fire-guard. Good size child proof deck ideal for summer BBQ's, and large fenced back yard with children's play equipment. Games, books and videos are provided for the unavoidable rainy days. Sky TV dish is installed with Freeview connected to TV, bring your Sky decoder, remote and power cord if you wish. Three bedrooms upstairs, two opening onto deck, internal access to downstairs bedroom plus the second shower and toilet. Pillows, duvets and blankets are provided, plus all beds have mattress protectors and electric blankets. Pets by arrangement at time of booking. This property would not suit guests who require wheelchair access. NOTE: Under Kiwi bach tradition you are expected to: Clean the house and do the dishes before you leave; Bring your own linen (towels/sheets/tea towels); Please report any damage/breakages. Fully fenced section with off-road parking for your boat. Not suitable for wheelchairs as living area is up stairs. Gorgeous views great peaceful location and fab walk alongside the lake. Dog kids and adults all happy. A extremely pleasant stay in a lovely area with wonderful walks and a beautiful view of the lake from the house. The accommodation was well laid out and suitable for a large family to stay comfortably, with everything you need. I would not hesitate to recommend this venue and will return. Thank you. It was perfect for what we wanted. Our extended family were in places nearby, it was lovely. Wee mousie had been in cupboards under sink, but we have a wee mousie as well .... We did find an unwashed roasting dish in the oven, so easy to forget. It was cleaned and put back. Lovely to see the lake from different angle after many, many years viewing from Motuoapa! Neighbours did decide to turn music up after midnight until about 2.00 a.m! Fortunately it was only me who took a while to go to sleep! Thank you, Robin and Joy. Thank you for your response, we will deal to our mouse friend!! Lovely property in a lovely place. Handy to amenities. Great weekend. Great Bach with an excellent location. The house was clean and tidy and the dog loved the large fully fenced yard. We will definitely be back! Thank you for your comments and you would be welcome back.